Once the pride of soft-spoken enthusiasts with deep pockets, sleeper cars appeal to those who want to enjoy high performance driving without drawing too much attention to themselves, and of course, enjoying the pleasure of putting one or two loud mouths in their place every once in a while. These days however sleeper cars are few and far between. Today’s BMW M and Mercedes-AMG cars make it a point to be as loud as possible, as opposed to their discretely styled cars from the ‘90s. Even fast Volvo wagons, once iconic sleeper cars, are now styled to draw attention. In a way, that’s the right thing to do because soft spoken enthusiasts don’t buy enough cars to keep car companies afloat. You know you have sleeper on your hands when you go “What the hell is this thing and why isn’t it running out of breath already? !” and when you realize that you are outrunning cars that are supposedly more powerful than this Passat's small-ish 1.8-litre turbocharged four-cylinder. To recap, the all-new B8-generation Volkswagen Passat benefits from Volkswagen’s modular and lightweight MQB platform, plus a new 1.8 TSI engine, which despite using the same EA888 engine code, is different from the 1.8 TSI unit used in the previous B7-generation Passat. Together, the lightweight structure and new engine has significantly changed the all-new Passat’s character. While the previous Passat was composed and dignified in a Teutonic manner, this all-new Passat is an athlete in a suit. 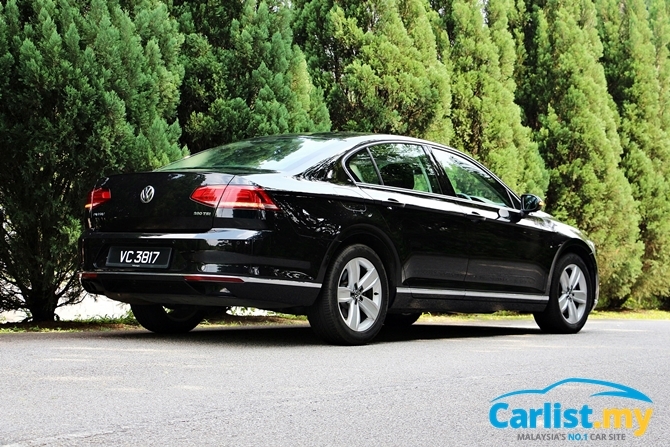 There are three variants to choose from – 1.8 TSI Trendline (RM159,990), 1.8 TSI Comfortline (RM179,990) and 2.0 TSI Highline (RM198,990). Prices quoted are excluding insurance. The model tested here is the mid-range 1.8 TSI Comfortline model. 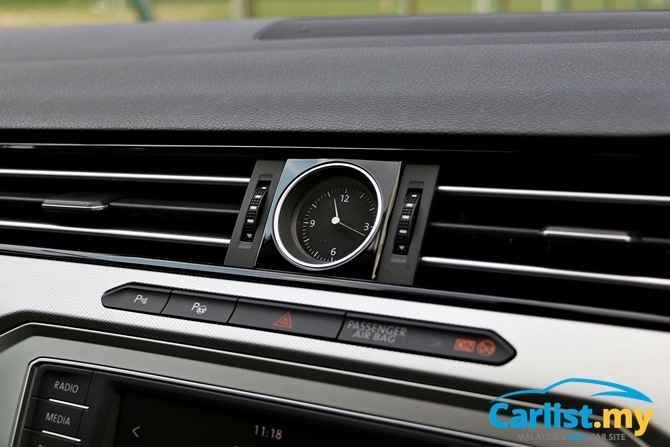 Compared to the 2.0 TSI Highline, the most obvious feature omitted from the Comfortline is the full LCD Active Information Display instrument cluster, wood trimmed interior (which appears at odds with the car’s sporty character), DCC adaptive suspension. 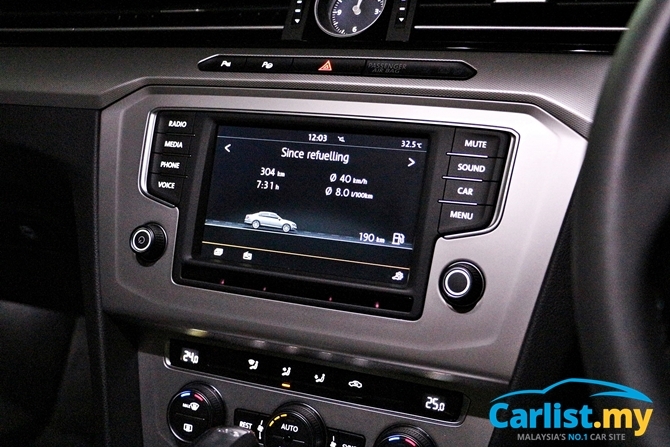 Frankly, throughout our drive in the 1.8 TSI Comfortline, we never missed not having any of those features at all. 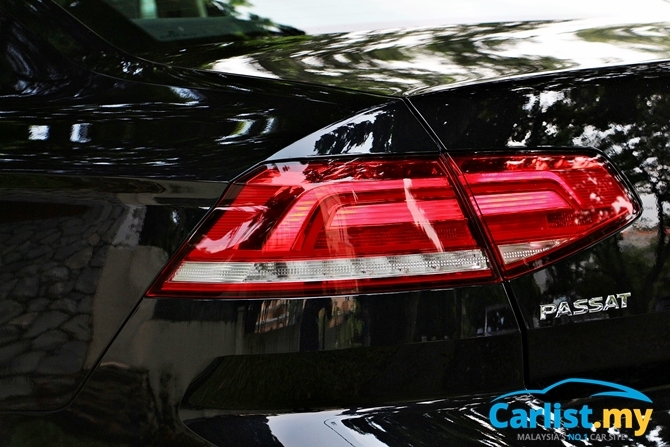 Compared to its peers, the Passat’s silhouette cuts a sportier profile. At night, the distinctive LED light pattern in front and behind sharply strikes away the darkness. Packaged together with restrained application of chrome trimmed details along its sveltely lines, the Passat looks more like a premium sedan that competes against entry-level Mercedes-Benz, BMW and Audi models rather than regular Japanese D-segment sedans. In fact, we will take it one step further and say that the Passat looks more premium than the latest B9-generation platform Audi A4, which is a distant cousin of the Passat, all within the greater Volkswagen Group family. Usually, it is the more expensive variant that has a better looking interior but in the case of the Passat, it is the mid-range Comfortline’s ‘Silver Diamond’ brushed metal trimmings that suits the Passat’s sporty business sedan character rather than the 2.0 TSI Highline’s ‘Brilliant Pine’ wood trim. Typically, Volkswagen’s interior don’t impress much. Yes they are well designed but they tend to look very somber, acres of grey-ville with little to stir the emotions. This all-new Passat however, feels every bit expensive. This B8 Passat however, has without a doubt, the most premium cabin in the segment but nevermind about its peers, because the interior feels more premium than a BMW 3 Series, easily matching an Audi A4. The centrally mounted analogue clock adds a Bentley-esque vibe to the interior. Even without the 2.0 TSI’s fancy Active Information Display full LCD instrument panel, the cabin doesn’t look any poorer. Thanks to a more space efficient MQB platform, the all-new Passat is now a lot more spacious than before, easily matching, if not exceeding the segment leader Honda Accord. When the B8 Passat was launched earlier this year, the narrative was very much focused on the 2.0 TSI Highline variant – that it’s a Golf GTI wrapped in a more discrete business class four-door sedan body. The lesser 1.8 TSI variant is often overlooked, even by yours truly. 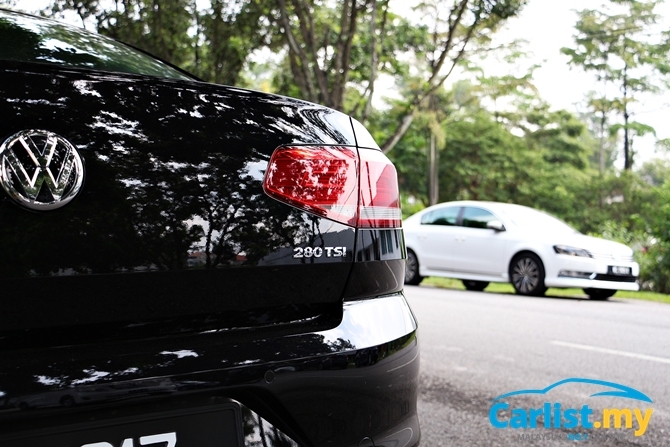 Why look to the 1.8 TSI when the additional RM20k buys you enough firepower to blast away more expensive premium German sedans, or so we thought. On paper, the Passat 1.8 TSI is several paces off the mark compared to the 240 PS Ford Mondeo 2.0 EcoBoost (RM200,388 excluding insurance). The Toyota Camry Hybrid (RM160,140 excluding insurance) has in theory, 205 PS of power but it’s just a momentary burst, and performance deteriorates as soon as charge levels of the traction battery drops. Pottering around in urban traffic, the B8 Passat doesn’t surprise much. It drives like how its engine output figures suggests. It's everything that we have come to expect from the Passat, both good and bad. Similar to other dual-clutch transmission equipped cars, shifts are snappy fast on the open roads but it can sometimes be caught off guard during light throttle applications, especially when you are climbing uphill in heavy traffic. To achieve a smoother drive, allow for a wider gap between you and the car in front before accelerating away gently, as opposed to inching forward as you normally would in a regular torque converter automatic transmission car. 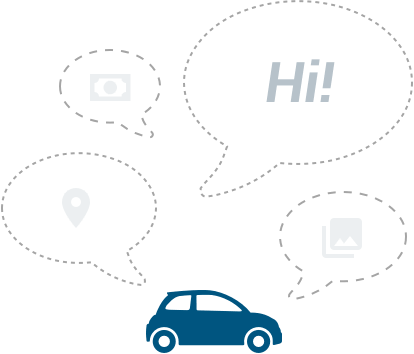 The Auto Hold function has also improved a lot, engaging and disengaging the brakes in a much smoother manner now, thus contributing to a slightly less stressful rush hour commute. If you want to wow your friends, you can also showoff the Park Assist 3.0 self-parking feature that can now do both parallel and perpendicular parking. The new engine's vital stats of 180 PS and 250 Nm is 20 PS more than before, while torque values remained unchanged - good enough but there is nothing here that suggests wheel-spinning, tarmac burning performance. Don't let the stats fool you. 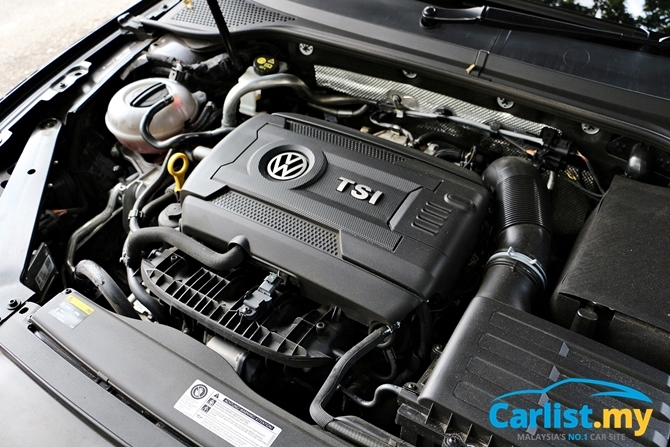 In the real world, this new 1.8 TSI engine, pulls like a runaway train. You will run out of clear roads before the engine runs out of puff. Much of this is attributed to its new MQB-fed diet. Compared to the previous B7 Passat 1.8 TSI, this new model is 112 kg lighter (unladen weight 1,405 kg)! With less weight, the effect of the new engine’s modest gains in power is amplified many times over. Factor in the lower (-14 mm) and wider stance (+12 mm), longer wheelbase (+79 mm), and wider track width (+34 mm front, +17 mm rear), this modest looking mid-range Passat drives like a proper business class sports sedan. 0-100 km/h is completed in 7.9 seconds, but in the real world, the sprint to the century mark doesn’t mean much. What matters more is in-gear acceleration, circa 60 – 120 km/h, because it is around this range where overtaking occurs, and this is where the Passat comes into its sweet zone. It’s also why the Passat is so well suited for effortless long distance drives. Punch the throttle, the intensity of the acceleration feels a lot more than 250 Nm. Bury the throttle and the relentless wave of torque doesn’t taper off until 5,000 rpm. It will continue to propel you forward like you’ve just been released from a sling shot. There are paddle shifters behind the chunky leather wrapped steering wheel but never once did we encounter a situation where we could shift faster than the car. It may have just a 1.8-litre turbocharged engine, but larger 2.0-litre turbocharged entry and mid-range C-Class and 3 Series have nothing on this supposedly lesser endowed Passat. Steering feedback has also been improved, allowing the driver to better take advantage of the significantly higher levels of agility that the new, lower and wider Passat is capable of. It may be just a front-wheel drive car, but you are more likely to run out of talent before the Passat runs out of grip. Such is the level of mechanical grip the chassis naturally affords. As far as driving performance goes, this Passat 1.8 TSI can confidently hold its ground even when compared against its more powerful sibling, the Passat 2.0 TSI Highline. 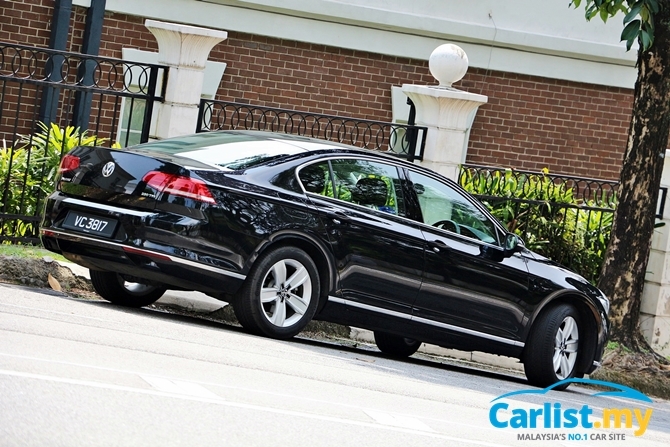 Even without the benefit of the Passat 2.0 TSI Highline’s DCC adaptive suspension, this Comfortline model’s ride quality is easily the best in its class – supple over poor surfaces yet firm enough to be pushed hard. As for its cruising manners, well this is a Volkswagen, not much elaboration is necessary. If the roads and traffic allow you to, and if you choose to take liberties with your driver’s license, this Passat can easily sustain 180 km/h without much effort, while maintaining a library quiet cabin. 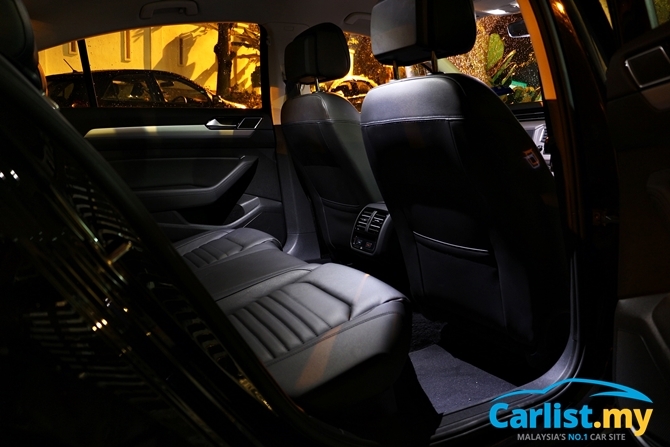 Rear occupants have ample legroom and enjoy firm support from the nicely sculpted seats that aren't too different from those used in premium sedans from two classes above the Passat. 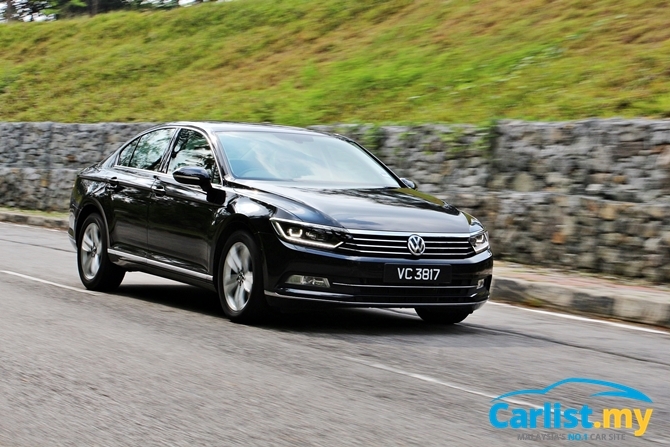 For all its performance potential, the Passat is a remarkably fuel efficient car, averaging no more than 9-litre/100 km after nearly 450 km of driving distance, out of which 300 plus km was highway driving, with the rest of it in typical KL traffic. The all-new Passat has so much to offer that it’s just a shame that Volkswagen is still haunted by powertrain-related horror stories that afflicted some of its earlier cars. This all-new Passat is the only car in its class that is able to close the chasm between regular Honda Accord/Toyota Camry-class D-segment sedans and entry premium sedans like the Mercedes-Benz C-Class and BMW 3 Series. The alternative to the Passat is the RM194,647 Mazda 6 2.5-litre and the RM200,388 Ford Mondeo but neither can match the Passat’s combination of interior space, power, and style. Although enthusiast drivers love both the Mazda and the Ford, neither command sufficient business-like creed among the segment’s target corporate audience. Most choose to either stay with the tried and tested Accord/Camry, or make a leap to a C-Class or 3 Series while forcing themselves to compromise on interior space. 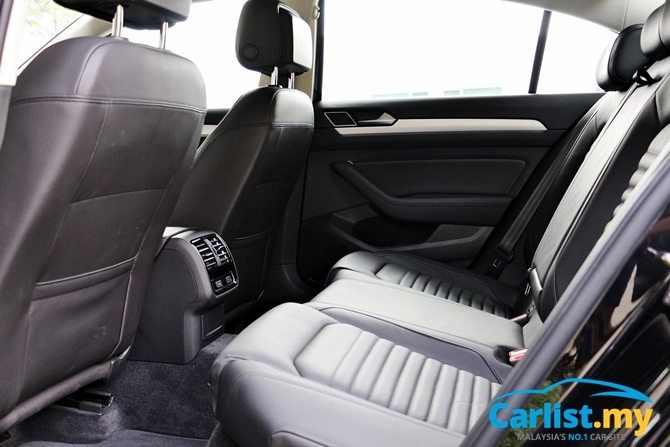 The Passat not only offers capacious amount of space and comfort, but looks more expensive than it actually is. Its interior is only second to a Mercedes-Benz C-Class, never mind its class rivals from Japan, and it certainly drives nothing like most sedans on this side of the quarter-million Ringgit mark.  Sure, the more expensive 2.0 TSI Highline model drives even better, and its 6-speed wet-clutch dual-clutch transmission have a reputation for being more reliable in our climate, again due to lingering doubts on the reliability of Volkswagen cars. The DQ200 7-speed dry-type dual clutch unit used in the Passat Comfortline is already in its fifth iteration and whatever issues that dogged earlier designs have all been ironed out. But of course, changing perception takes a longer time that designing a new transmission. 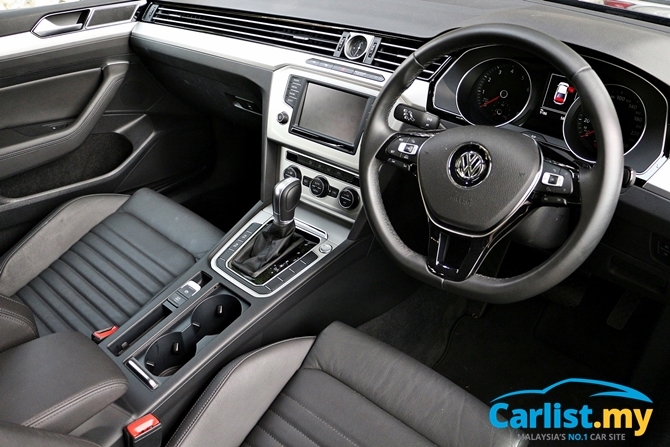 For us, this 1.8 TSI Comfortline is the pick of the Passat range. It’s luxurious and powerful enough. The 2.0 TSI Highline’s full LCD Active Information Display wows your friends but we suspect the novelty will wear off very quickly, and there is very little reason to choose the Highline’s fancy adaptive dampers (which at some point, needs replacement and they are not cheap) over the Comfortline’s proven, well sorted mechanical setup that already delivers such a good ride. The fact that it packs so much performance within a classy yet unassuming look makes it an ideal sleeper car well suited for corporate folks. Speak softly and carry a big stick. 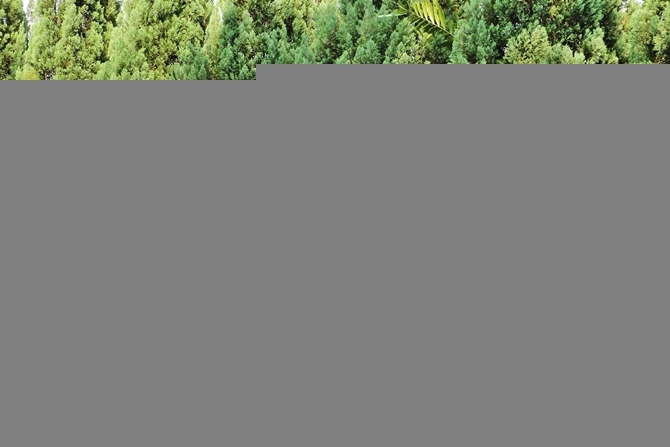 Interested in the all-new Volkswagen Passat? 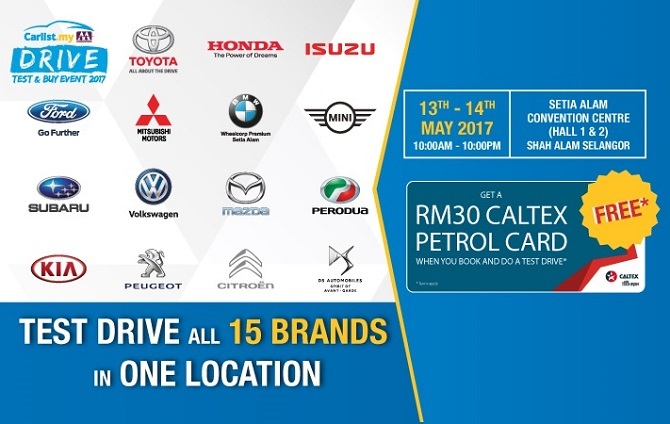 Come to the Carlist.my DRIVE Test and Buy event this weekend at Setia City Convention Centre.  Sign up here to test drive the Passat and compare it against the Toyota Camry, Honda Accord and BMW 3 Series.